This frame is available in a Silver effect molding, the glass size is 10”x8” (255x205mm) and the medium sized display area is approx. 8”x6” (204x152mm), there is a single display area and this is a great frame to use if you wish to display two casts of a baby or a single cast of an older child, next to a favourite photo (attached to the backing card if you wish to). 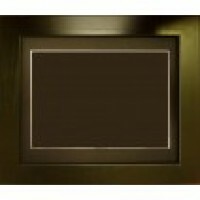 This frame can be used landscape or portrait, depending on your preference. The silver effect molding has a darker fleck that runs throughout the molding, making it perfect to enhance any of the paint colours we have available. This frame can also be used for displaying other 3d keepsake items such as first shoes, other birth memorabilia or small wedding keepsakes. Our box frames have a depth of approx. 2” (50mm) and they all include professional framing cord and all the frame fixings so that you can hang them on the wall. This is a very sturdy frame with a back box that is securely fixed to the back of the frame, the back box is approx 2" (50mm) deep, making it perfect to house 3d casts, giving you the optimal depth to enhance the 3d effect; because it is a good depth, this makes it suitable to display many other items of memorabilia too, so it may be suitable to display other collectable items that you may wish to have out on display, but protected behind the glass front, our frames have glass fronts, rather than perspex which scratches too easily. 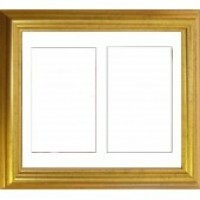 The frame comes complete with the single spaced mount already in it, all ready for you to use. All necessary fixings for the frame. 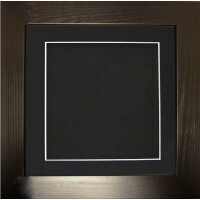 A luxury deep box frame in a silver sffect molding, the glass size is 10”x8” (255x205mm) and the dis..